It's impossible to see the BMW 4 Series Coupe, Convertible and Gran Coupe and not feel their athleticism. Yes, they were born from the iconic 3 Series. But, a sleeker, more aggressive design matched with thrilling power makes each 4 Series model stand out in its own beguiling way. It started with a vision. A vision to completely reimagine the future of mobility and rethink what it means to drive an electric vehicle. And here we are—this vision is now a reality. Meet the all-electric BMW i3 and the plug-in hybrid BMW i8. It's time to forget everything you once thought about electric cars and imagine a world powered by performance, design, innovation, and efficiency. This is the world of BMW i. In the heart of the Sonoma Valley and the Bay Area, Hansel BMW strives to be much more than a local car dealership. With a highly skilled and dedicated staff that is full of knowledge of this luxury car dealership in Santa Rosa sells new BMW and pre-owned cars, and provides all the car service & repairs, auto parts and auto financing options to support them. 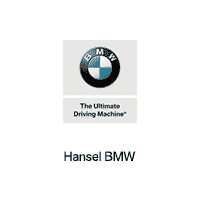 One call to Hansel BMW at (888) 540-1755 will start to convince of this fact: You don’t need to go any further to meet all your BMW service, parts, and auto financing needs. As a BMW dealer near west coast cities like Petaluma, Rohnert Park & Windsor, CA, we understand your needs and have a wide variety of cars to meet them. Come see them yourself at 2925 Corby Ave. Santa Rosa, CA, 95407. Get a new 2018 or 2019 BMW car or SUV from Santa Rosa’s Hansel BMW of Santa Rosa and you’ll get a great vehicle, at a great price, with the experience and dedication of our team behind you throughout the purchasing process and the duration of your ownership of your BMW automobile. Our service to you does not end at the sale. Call our greater Santa Rosa, Petaluma, Rohnert Park & Windsor, CA dealership at (888) 540-1755 anytime with questions. Our entire team at Hansel BMW of Santa Rosa is here to help. If you’re looking to purchase from a dealership dedicated to its customers, come by Hansel BMW of Santa Rosa and experience our service for yourself! Looking for a pre-owned car or certified pre-owned BMW in Santa Rosa that exceeds your expectations? Hansel BMW of Santa Rosa will find you the perfect well maintained pre-owned BMW or certified pre-owned car at an unbeatable price. With a huge inventory of high-quality vehicles, we are certain that we can locate a pre-owned car that suits your taste. Our greater Santa Rosa pre-owned car inventory has vehicles by many of today’s top automakers. If you have not been able to locate a specific new or pre-owned car in Santa Rosa we are at your assistance. Complete our no-obligation CarFinder form and we will notify you when the vehicle arrives at our Santa Rosa area new and pre-owned BMW dealership. Need a car loan or BMW lease in Santa Rosa, CA? The financial experts at Hansel BMW of Santa Rosa are available to answer your questions regarding car loans and BMW auto leases. Have a question about interest rates, car loan terms, or programs such as leases for individuals with bad credit, or no credit at all? Call us at (888) 540-1755 and get the answers you need. At Hansel BMW of Santa Rosa we’ll help you get auto financing quickly so you can go about your busy schedule with your new vehicle. For truly helpful assistance in securing a car loan in Santa Rosa, CA, visit us today! At Hansel BMW, we want you to get the most miles out of your new or pre-owned car which is why we offer BMW auto repair and maintenance services to keep your vehicle in top condition. Our greater Santa Rosa BMW service & repair center features some of the area’s most skilled mechanics. Do you need car repair in Santa Rosa, CA? Sign up for a service appointment online and our auto technicians will get your BMW repaired as quickly as possible. Hansel BMW of Santa Rosa also stocks a comprehensive inventory of BMW auto parts so that you can repair or sup up your automobile. Our car parts specialist are standing by to help locate the BMW component you need to get your vehicle back on the road. And if it’s auto body repair you need to visit our auto body repair shop where our expert technicians will get your car looking like new. See one of our new or pre-owned cars in person by visiting our Santa Rosa BMW dealership at 2925 Corby Ave. Santa Rosa, CA 95407. We are looking forward to serving your automotive need.